Oh the hype is so real right now. IFA kicks off this week in Berlin and we are expecting to be consumed by a new wave of Android Wear smartwatches. Previous reports have suggested that Motorola, Huawei, ASUS, and LG will all unveil new Android Wear products, a couple of which we think we know about. Motorola is probably at the top of the list, thanks to the popularity amongst Android enthusiasts over their original Moto 360. 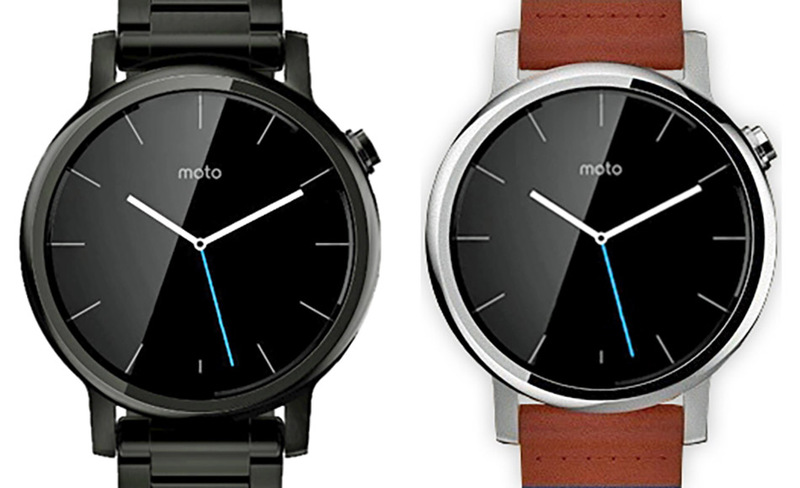 I think it’s safe to say that we all want to see the 2nd gen Moto 360 sooner than later. Through a batch of leaked press renders over the weekend, we have some clean new looks to chat about. Former professional leaker Evan Blass gave us the image at the top of the post, which appears to be straight up online store or press renders of the new Moto 360 (2nd gen). We are seeing both black and silver casings, along with metal and leather band options. Neither of those details are necessarily news, since that’s exactly what we got with the original. But, we are seeing that 2-o’clock crown position and lugs attached to the watch’s body that are most indeed new to this watch. As you all know, the previous Moto 360 had the cleanest design (and still has in my opinion) of any smartwatch, with its round casing, little bezel, and lack of lugs, that allowed watch band to almost disappear minimally into its body. This new version has that same minimal bezel, but man, I don’t know that any of us wanted lugs. I think we all just wanted that black bar to go away and to see improvements on the inside, like a processor not made in 2009. So far, we are seeing all sorts of black bar in every new image and have no idea what Motorola is doing in terms of processor. Finally, @upleaks also gave us the first picture of a watch they are calling the Moto 360 Sport. This is what it looks like. This is the first we are hearing of a sport model, but I can see how this might be a good arena for Motorola to re-enter. Fitness products are all the rage these days. If you can create a fitness related smartwatch that does more than your typical tracker (think Fitbit), with sport-like band (seen above) and fitness-ready apps to track runs, workouts, and other activities, you could have something. We still have no idea on pricing or availability. We should know this week, assuming Motorola comes through with announcements over the next couple of days.